I found this at Metrojaya lately, and it is quite a rare packing to be seen. The package is available at RM16.90 or RM5.63 each models. The package looks old, and I think they were transferred from some other places to Metrojaya. Not many good combinations available, and this is the best pack I found. 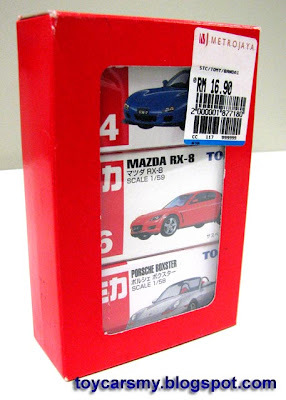 The packaging is good if Litt Tak decides to offer some promotion on Tomica later. Perhaps the selling price will be cheaper or near RM16.90 for 3 models. nice bro..last month i got that pack from jusco bukit raja.